In the present study, we have shown for the first time that a plant steroid, diosgenin, causes an inhibition of the growth of fibroblast-like synoviocytes from human rheumatoid arthritis, with apoptosis induction associated with cyclooxygenase-2 (COX-2) up-regulation. Celecoxib, a selective COX-2 inhibitor, provoked a large decrease in diosgenin-induced apoptosis even in the presence of exogenous prostaglandin E2, whereas interleukin-1β, a COX-2 inducer, strongly increased diosgenin-induced apoptosis of these synoviocytes. These findings suggest that the proapoptotic effect of diosgenin is associated with overexpression of COX-2 correlated with overproduction of endogenous prostaglandin E2. We also observed a loss of mitochondrial membrane potential, caspase-3 activation, and DNA fragmentation after diosgenin treatment. Rheumatoid arthritis (RA) is an inflammatory joint disease in which perpetuation of chronic synovitis leads to bone and cartilage degradation. Inflammatory cytokines or soluble factors are essential in the pathogenesis of RA. IL-1 and tumor necrosis factor-α are the principal mediators of tissue destruction in many immunoinflammatory diseases such as RA [1–3]. The two cytokines induce, in synergy, the production of high levels of matrix metalloproteinases by synovial cells and chondrocytes . IL-6 and IL-8 also participate in the pathogenesis of RA; for example, IL-6 supports the proliferation of synovial cells , while IL-8 promotes the formation of new blood vessels in synovial membrane . RA is characterized by the proliferation of synoviocytes, which also produce prostanoids. Eicosanoids and prostanoids are important lipid mediators that are produced at elevated levels in inflamed tissues including rheumatoid synovium and in cultured human RA fibroblast-like synoviocytes (FLS) [7–11]. Cyclooxygenase (COX), which converts arachidonic acid into prostaglandin endoperoxides, is the rate-limiting enzyme in prostanoid synthesis . At least two forms of COX have been identified and their genes have been cloned [13, 14]. COX-1 is constitutively expressed in most cells and tissues. In contrast, COX-2 is highly inducible by serum, growth factors, lipopolysaccharides, and cytokines, especially interleukin-1 (IL-1), in certain cell types involved in inflammatory processes, e.g. fibroblasts and macrophages [15, 16]. Crofford and co-workers  showed that IL-1β enhanced de novo synthesis of COX-2 – but not of COX-1 – mRNA and protein either in rheumatoid synovial explants or in cultured rheumatoid synoviocytes. These observations suggest that COX-2 may play an important part in the overproduction of prostaglandin E2 (PGE2) by rheumatoid synovia. Recent reports have outlined the role of COX-2 and prostaglandins in cell apoptosis, particularly in cancer cells [18–20]. Overexpression of the COX-2 gene protects cancer cells from apoptosis, and drugs that inhibit COX-2 have been shown to induce programmed death in these cells [21, 22]. In addition, the use of nonsteroidal anti-inflammatory drugs (specific or nonspecific COX-2 inhibitors) has been shown to reduce the size and number of neoplastic polyps in patients with familial polyposis [23, 24]. Alterations in the apoptosis of synovial cells have been described in resident synoviocytes as well as in inflammatory cells and are associated with the pathogenesis of RA . These changes constitute hallmarks of synovial cell activation and contribute to both chronic inflammation and hyperplasia. RA FLS are affected most prominently, and their resistance to apoptosis has been linked closely to the progressive destruction of articular cartilage. The role of COX-2 and prostaglandins in synoviocyte death is still under investigation. We have investigated for the first time the effect of diosgenin, a plant steroid, on the proliferation rate and apoptosis in the human RA FLS. Particular attention was paid to the modulation of COX-2 expression and activity in RA synoviocyte viability. Dulbecco's modified Eagle's medium (DMEM), fetal calf serum (FCS), and penicillin–streptomycin were supplied by Gibco-BRL (Cergy Pontoise, France). Collagenase was obtained from Worthington Biochemical Corporation (Freehold, NJ, USA). Dispase, hyaluronidase, DNase I, diosgenin ([25R]-5α-spirosten-3β-ol), 4',6-diamidino-2-phenylindole (DAPI), 3-(4,5-dimethylthiazol-2-yl)-2,5-diphenyltetrazolium bromide (MTT), and monoclonal antibody β-actin were purchased from Sigma (Saint Quentin Fallavier, France). 5B5 and JC/70A monoclonal antibodies and secondary polyclonal antibody conjugated with peroxidase were purchased from Dako (Trappes, France). RMO52 monoclonal antibody and fluorescein (DTAF)-conjugated goat anti-mouse antibody were purchased from Immunotech (Marseilles, France). COX-2 monoclonal antibody was supplied by Santa Cruz Biotechnology (TEBU; Le Perray en Yvelines, France). JC-1 (5,5',6,6'-tetrachloro-1,1',3,3'-tetraethylbenzimidazole carbocyanide iodide) was supplied by Molecular Probes (Leiden, The Netherlands). CaspACE™ Assay System Fluorometric was supplied by Promega (Charbonnieres, France). Cell Death Detection ELISAplus was supplied by Roche Diagnostics (Meylan, France). Celecoxib was obtained from Pharmacia (Skokie, IL, USA). PGE2 and ELISA kits for PGE2 were purchased from Cayman Chemical (SpiBio, Massy, France). Recombinant human IL-1β and Quantikine® human IL-6 and IL-8 immunoassay kits were purchased from R&D Systems (Lille, France). RA synoviocytes were isolated from fresh synovial biopsies obtained from six RA patients undergoing hip arthroplasty. All patients fulfilled the 1987 American Rheumatism Association criteria for RA . The mean age of the patients was 62.2 ± 4.6 years (range 55–68 years). The mean disease duration was 9.3 ± 2.2 years. At the time of surgery, the disease activity score (DAS 28) was greater than 3.2. These activities were approved by local institutional review boards, and all subjects gave written informed consent. Synovia were minced and digested with 1.5 mg/ml collagenase-dispase, 1 mg/ml hyaluronidase, and 0.15 mg/ml DNase I for 3–4 hours at 37°C as previously described . After centrifugation, cells were resuspended in DMEM supplemented with 10% FCS, 4.5 g/l D-glucose, 25 mM Hepes, 100 U/ml penicillin, and 100 μg/ml streptomycin (Gibco BRL) in a humidified atmosphere containing 5% (v/v) CO2 at 37°C. After 48 hours, nonadherent cells were removed. Adherent cells (macrophage-like and FLS) were cultured in complete medium, and, at confluence, cells were trypsinized and only the FLS were passed. These cells were used between passages 4 and 8, when they morphologically resembled FLS after indirect immunofluorescence study (see Culture of human RA FLS). RA FLS were cultured 45–60 days before experimentation. This delay allowed the elimination of all possible interactions resulting from any preoperative treatment (with nonsteroidal anti-inflammatory drugs, analgesics, disease-modifying antirheumatic drugs, or steroids). Between passages 4 and 8, RA FLS were trypsinized. Cell count and viability were determined and cells were plated in culture plates or flasks (Falcon, Oxnard, CA, USA). Viability, measured by trypan blue dye exclusion  at the start and the end of culture, was always greater than 95%. FLS (105) from RA patients were used for indirect immunofluorescence study . The following monoclonal antibodies were used: 5B5 (anti-prolyl hydroxylase) for fibroblasts at 1/50 dilution (Dako, Burlingame, CA, USA), JC/70A (anti-CD31) for endothelial cells at 1/50 (Dako), and RMO52 (anti-CD14) for macrophages at 1/50 (Immunotech). The negative control was a mouse antibody of the same isotype (Immunotech). Incubations were performed at room temperature for 30 min. Binding of monoclonal antibodies was visualized using fluorescein (DTAF)-conjugated goat anti-mouse antibody (Immunotech) at 1/50 dilution. For all experiments, RA FLS were allowed to adhere and grow for 48 hours in culture medium before exposure to diosgenin. A stock solution of 10-2 M diosgenin was prepared in ethanol and diluted in culture medium to give a final concentration of 10–80 μM. The same amount of ethanol (<0.4%) was added to control cells. The culture medium was not changed during the entire study. Cell proliferation was measured using the MTT assay. Cells (103 cells/well) were plated in 96-well culture plates and grown for 48 hours before treatment with 10–80 μM diosgenin for 24–96 hours. MTT was carried out daily as previously described  and experiments were performed in sextuple assays. For light microscopy, after 24–72 hours of treatment, RA FLS cultured cells were fixed in PBS (pH 7.4) containing 4% paraformaldehyde for 20 min at room temperature and washed in PBS for 15 min. Observations were made with phase-contrast microscopy. Δψm was estimated using JC-1 (Molecular Probes). This is a fluorescent compound that exists as a monomer at low concentrations. At higher concentrations, it forms aggregates. Fluorescence of the JC-1 monomer is green, whereas that of the aggregate is red. Mitochondria with intact membrane potential concentrate JC-1 into aggregates, which fluoresce red, whereas de-energized mitochondria cannot concentrate it and fluoresce green . Human RA FLS were grown for 48 hours before treatment with 40μM diosgenin for 24 hours. Control cells were grown in medium containing the same amount of ethanol as treated cells. Adherent cells were incubated in 1 ml of medium containing JC-1 (1 μg/ml) for 30 min at 37°C and pictures were taken with a Nikon microscope ECLIPSE E800 (Nikon Corporation, Champigny sur Marne, France). Moreover, human RA FLS were stained with DAPI (0.5 μg/ml) for 5 min at room temperature in the dark and the cells were examined by fluorescence microscopy. After 40 μM diosgenin treatment for 24 or 48 hours, human RA FLS were homogenized in lysis buffer in accordance with the manufacturer's protocol (CaspACE™ Assay System Fluorometric, Promega). Fluorometric assays were conducted in white, opaque tissue-culture plates (Falcon, Becton Dickinson Labware, NJ, USA) and all measurements were carried out in triplicate. First, 100 μl of assay buffer (10 mM dithiothreitol, dimethyl sulfoxide, caspase buffer) (Promega) was added to each well. Peptide substrate for caspase-3 (Ac-DEVD–AMC [N-acetyl-Asp-Glu-Val-Asp–7-amino-4-methylcoumarin]) was added to each well to a final concentration of 2.5 mM. Caspase inhibitor (Ac-DEVD-CHO [N-acetyl-Asp-Glu-Val-Asp-aldehyde]) at 2.5 mM was also used just before the addition of the substrate. The supernatant of each cell lysate collected was added to each well to start the reaction. Background fluorescence was determined in wells containing assay buffer and substrate without cell lysate. Assay plates were incubated at 37°C for 1 hour for the measurement of caspase-3 activity. Fluorescence was measured with a microplate reader (Fluorolite 1000, Dynex Technologies, Chantilly, VA, USA) using 360 nm excitation and 460 nm emission filters. Raw data (relative units of fluorescence) corresponded to the concentrations of 7-amino-4-methylcoumarin released . Human RA FLS were cultured in six-well culture plates (2 × 105 cells/well). After diosgenin treatment (40 μM for 24 or 48 hours), apoptosis was quantified on pooled cells (floating and adherent) using the 'cell death' ELISA (Cell Death Detection ELISAplus, Roche Diagnostics). Cytosol extracts were obtained in accordance with the manufacturer's protocol and apoptosis was measured as previously described . Other conditions are represented by cells pretreated for 4 hours at 37°C with IL-1β (1 ng/ml) or celecoxib (1 μM) and then 40 μM diosgenin was added in each flask for 24 or 48 hours in DMEM containing 10% (v/v) FCS in an atmosphere of 5% CO2. We verified that under our experimental conditions 1 μM celecoxib was not proapoptotic. To examine the role of exogenously added PGE2, we preincubated cells for 4 hours with COX-2 inhibitor (celecoxib 1 μM) in the absence or presence of PGE2 (10 nM), followed by incubation with 40 μM diosgenin for an additional 24 hours. Human RA FLS were cultured in 150-cm2 tissue-culture flasks. 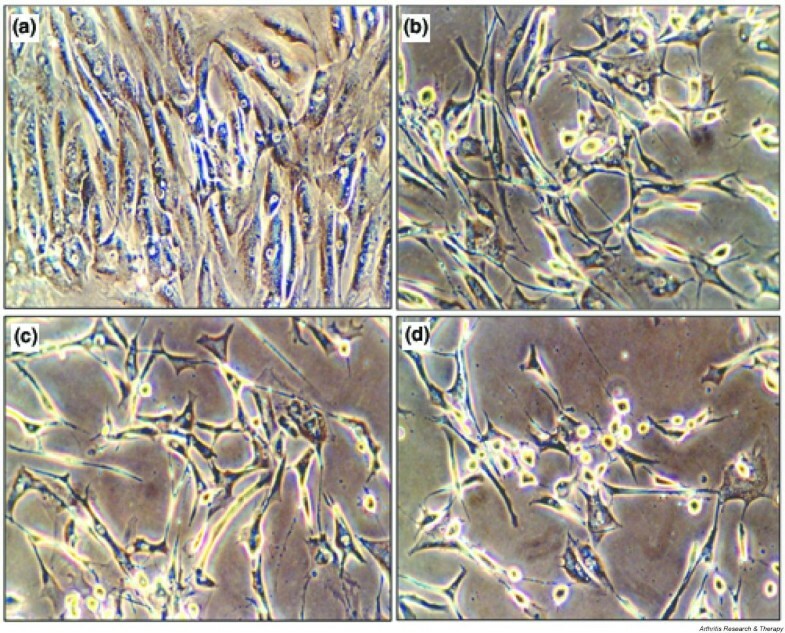 After treatment with 40 μM diosgenin for 24 or 48 hours or with IL-1β (1 ng/ml) for 24 hours, adherent cells were trypsinized and pooled with the floating cell fraction. Western blot analysis was performed as previously described , using the primary monoclonal antibodies β-actin (mouse anti-human β-actin [1:5000], Sigma), COX-2 (mouse anti-human COX-2 [1:100], Santa Cruz Biotechnology), and secondary polyclonal antibody conjugated with peroxidase (Dako). Blots were visualized using enhanced chemiluminescence reagents (Amersham Biosciences, Orsay, France) and immediately exposed to x-ray film. Human RA FLS were grown in 25-cm2 tissue-culture flasks for 48 hours before treatment. After washing with PBS (pH 7.4), cells were pretreated for 4 hours at 37°C with IL-1β (1 ng/ml) or celecoxib (1 μM) and then 40 μM diosgenin was added in each flask for 24 or 48 hours in DMEM containing 10% (v/v) FCS in an atmosphere of 5% CO2. Other conditions are represented by cells incubated with 40 μM diosgenin alone, IL-1β (1 ng/ml) alone, or celecoxib (1 μM) alone for 24 or 48 hours. The PGE2 concentration in the medium was measured using an ELISA kit in accordance with the instructions of the manufacturer (Cayman Chemical) and was normalized with respect to the number of viable cells present in the particular culture at the time of sampling. Human RA FLS were grown in 25-cm2 tissue-culture flasks for 48 hours before treatment. After washing with PBS (pH 7.4), cells were pretreated for 4 hours at 37°C with IL-1β (1 ng/ml) and then 40 μM diosgenin was added to each flask for 24 or 48 hours in DMEM containing 10% (v/v) FCS in an atmosphere of 5% CO2. Other conditions are represented by cells incubated with 40 μM diosgenin alone or IL-1β (1 ng/ml) alone for 24 or 48 hours. The cytokine concentration in the medium was measured using a Quantikine® human IL-6 or IL-8 immunoassay kit in accordance with the instructions of the manufacturer (R&D Systems) and was normalized with respect to the number of viable cells present in the particular culture at the time of sampling. The median and standard deviation (SD) were calculated using Excel (Microsoft Office, Version 98). Statistical analysis of differences was carried out by analysis of variance (ANOVA) using StatView Version 5.0 (SAS Institute Inc, Cary, NC, USA). A P-value of less than 0.05 (Fisher's protected-least-significant-difference test) was considered to indicate significance. Cells were cultured in 10% FCS medium with or without 10–80 μM diosgenin for 24–96 hours and cell proliferation was evaluated by the MTT test. 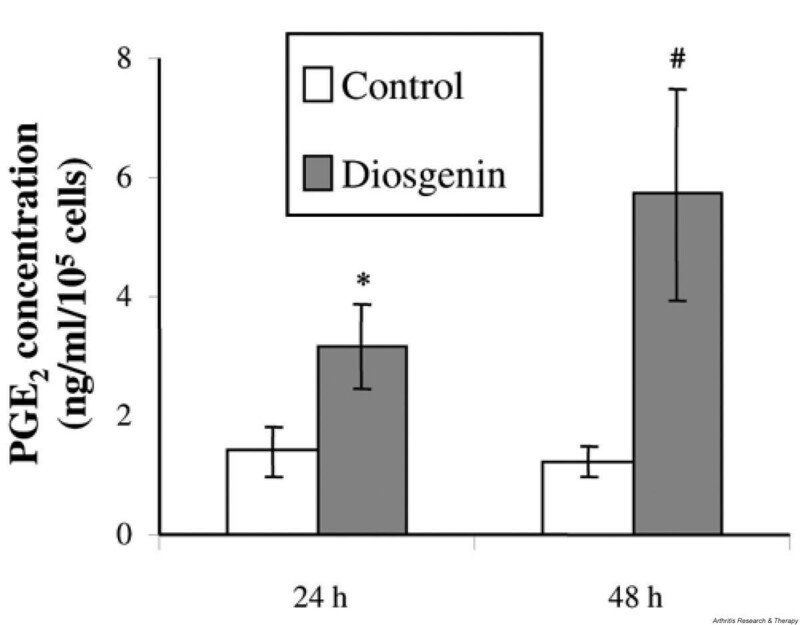 Under our experimental conditions, a dramatic decrease in proliferation was observed until 24 hours after diosgenin treatment (40 and 80 μM) (Fig. 1), especially at 24 hours for 40 μM diosgenin, when the percentage of inhibition was 76% (P < 0.05). As the percentage of inhibition did not strongly increase at 80 μM (79%; P < 0.05) (Fig. 1), we chose 40 μM for subsequent experiments. Effect of diosgenin on proliferation of human rheumatoid arthritis (RA) fibroblast-like synoviocytes (FLS). Cells were cultured in 10% FCS medium for 48 hours and then incubated (time 0) for 24–96 hours with diosgenin at 10–80 μM. RA FLS proliferation was evaluated by the MTT [3-(4,5-dimethylthiazol-2-yl)-2,5-diphenyltetrazolium bromide] test. Measurements were made on FLS from six different patients. Representative results from six independent experiments are shown; values are the mean ± SD from triplicate cultures. * A P value of less than 0.05 (Fisher's protected-least-significant-difference test) was considered to indicate significance in comparison with controls. OD, optical density. Direct observation with phase-contrast microscopy demonstrated that human RA FLS treated with 40 μM diosgenin showed numerous morphological differences from control cells (Fig 2a). Cell shrinkage, cytoplasm condensation, and formation of cytoplasmic filaments appeared after 40 μM diosgenin treatment for 24, 48, and 72 hours (Fig. 2b,2c,2d respectively). Morphologic changes in human rheumatoid arthritis fibroblast-like synoviocytes. 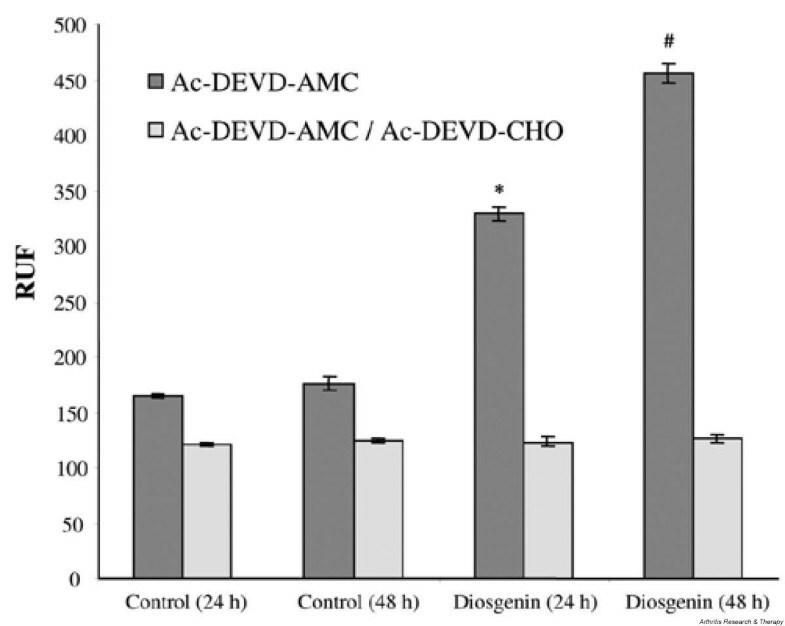 Cells were incubated without (a) or with 40 μM diosgenin for 24 hours (b), 48 hours (c), or 72 hours (d). Original magnification ×400. To ascertain potential mechanisms by which diosgenin inhibited the human RA FLS proliferation rate, we studied the effect of diosgenin on Δψm, because alterations in mitochondrial structure and function have been shown to play a crucial role in apoptosis. Δψm was analyzed in adherent RA FLS after 24 hours of treatment with diosgenin using the potential-dependent, aggregate-forming lipophilic cation JC-1. Fluorescence, seen in Fig. 3, showed Δψm differences. We found that diosgenin induced a decrease of Δψm in RA FLS, shown by the incorporation of JC-1 monomers into the mitochondria (fluorescence in green, Fig. 3b), compared with cytosolic J-aggregate formation at high membrane potential in control cells (fluorescence in red, Fig. 3a). 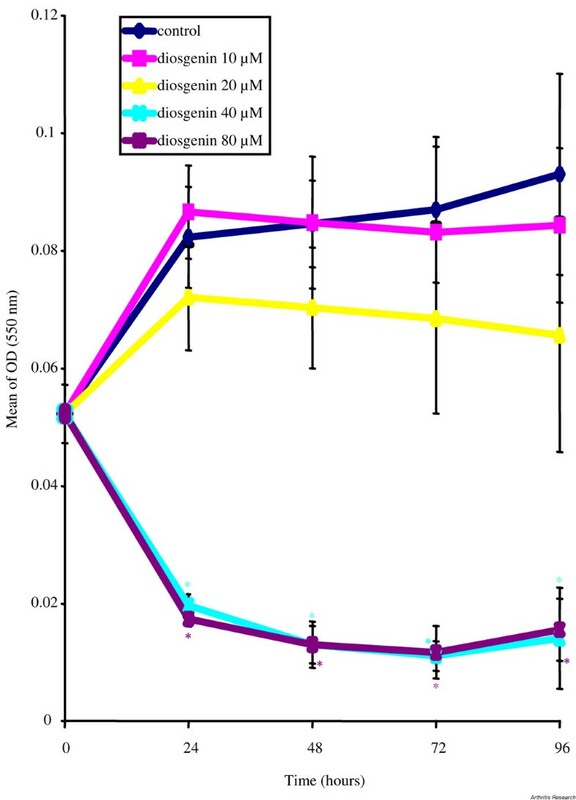 Analysis of mitochondrial membrane potential (Δψm) after diosgenin treatment. Human rheumatoid arthritis (RA) fibroblast-like synoviocytes (FLS) were cultured in 10% FCS medium for 48 hours and then treated (b) or not (a) with 40 μM diosgenin. Δψm was analyzed in adherent RA FLS after 24 hours of treatment, using the potential-dependent aggregate-forming lipophilic cation JC-1 (5,5',6,6'-tetrachloro-1,1',3,3'-tetraethylbenzimidazole carbocyanide iodide). Red fluorescence (a) represents mitochondria with intact membrane potential whereas green fluorescence (b) represents de-energized mitochondria. Staining with DAPI (4',6-diamidino-2-phenylindole), showed that diosgenin treatment of cells altered the extracellular and nuclear membrane permeability, as is shown by the nuclear localization of the DAPI (b, white arrows) in comparison with untreated cells (a). Pictures were taken with a Nikon microscope ECLIPSE E800 (original magnification ×400). One of three representative experiments from three different patients is shown. Moreover, the morphology of treated human RA FLS was examined by fluorescence microscopy after DAPI staining. Diosgenin treatment of human RA FLS altered the extracellular and nuclear membrane permeability, as is shown by the DAPI nuclear localisation (Fig. 3b) in comparison with untreated cells (Fig. 3a). It is well known that apoptosis is characterized by chromatin condensation and DNA fragmentation and is mediated by the cysteine protease family called caspases, such as caspase-3, which is the major executioner of apoptosis. In our study, caspase-3 activity and DNA fragmentation were analyzed in human RA FLS treated or not with 40 μM diosgenin for 24 or 48 hours. Caspase-3 activity was significantly increased over time (2-fold at 24 hours and 2.6-fold at 48 hours in the diosgenin-treated cells versus controls; P < 0.05) (Fig. 4). Effect of diosgenin on caspase-3 activation in human rheumatoid arthritis fibroblast-like synoviocytes. After 48 hours' adherence, cells were cultured in 10% FCS medium and treated or not with 40 μM diosgenin for 24 or 48 hours, and then caspase-3 activity was measured with caspase-3 substrate (Ac-DEVD-AMC [N-acetyl-Asp-Glu-Val-Asp–7-amino-4-methylcoumarin]) in accordance with the manufacturer's protocol (see Materials and methods). Data are the mean ± SD of three experiments from three different patients and are expressed as relative units of fluorescence (RUF). *,# A P-value of less than 0.05 (Fisher's protected-least-significant-difference test) was considered to indicate significance in comparison with the relevant controls. Ac-DEVD-CHO, N-acetyl-Asp-Glu-Val-Asp-aldehyde. Quantitative determination of cytoplasmic histone-associated DNA fragments (mononucleosomes and oligonucleosomes) was performed with ELISA. Results showed that DNA fragmentation was enhanced 7-fold (P < 0.05) in treated cells at 24 hours and strongly induced at 48 hours (19-fold; P < 0.05) in comparison with controls (Table 1). Apoptosis was quantified on floating and adherent cells using ELISA (see Materials and methods). The fold induction of DNA fragmentation is shown relative to the value for the control culture, which is taken as 1. Data are expressed as mean ± SD of three experiments from three different patients. *,#A P value less than 0.05 (Fisher's protected-least-significant-difference test) was considered to indicate significance in comparison with controls. Numerous studies have shown that COX-2 expression prevents apoptosis in cancer cells, especially in colon cancer, in contrast to other cell types, for which the effects of COX-2 and related PGE2 in the regulation of apoptosis could very well be cell-type-specific. Here we show that diosgenin induced overexpression of COX-2 over time (Fig. 5). This overexpression was correlated with COX-2 activity. Indeed, PGE2 production was increased over time after diosgenin treatment: 2.3- and 4.7-fold (P < 0.05) at 24 or 48 hours, respectively, in comparison with controls (Fig. 6). Cyclooxygenase-2 (COX-2) western blot analysis in human rheumatoid arthritis fibroblast-like synoviocytes. Cells were cultured without agents (lanes 1 and 5, controls at 24 and 48 hours, respectively) or were incubated with 40 μM diosgenin for 24 hours (lane 2) or 48 hours (lane 3) or with IL-1β (1 ng/ml) for 24 hours (lane 4). Protein extracts prepared from the cells were subjected to western blotting and cellular expressions of COX-2 and β-actin were estimated using mouse anti-human COX-2 and β-actin antibodies, respectively, as described in Materials and methods. Each band was quantified by densitometry analysis software. One of three representative experiments from three different patients is shown. Effect of diosgenin on prostaglandin E2 (PGE2) production by human rheumatoid arthritis fibroblast-like synoviocytes (FLS). Cells were cultured in 10% FCS medium for 48 hours and then treated or not with 40 μM diosgenin for 24 or 48 hours. The PGE2 levels in the culture medium were measured by enzyme immunoassay. Measurements were made on FLS from four different patients. Data are expressed as mean ± SD of four experiments. *,# A P-value of less than 0.05 (Fisher's protected-least-significant-difference test) was considered to indicate significance in comparison with the relevant controls. To further develop these results, it would be interesting to know if COX-2 was directly associated with diosgenin-induced human RA FLS apoptosis. In order to clarify this point, we used a specific inhibitor of COX-2 activity to verify DNA fragmentation after diosgenin treatment and examined the effect of exogenously added PGE2 on diosgenin-induced synoviocyte death. We also studied whether COX-2 induction with IL-1β could have a synergistic effect with diosgenin on DNA fragmentation. Our results showed that pretreatment with celecoxib before diosgenin treatment inhibited COX-2 activity over time: PGE2 production was decreased by 73% and 95% (P < 0.05) at 24 and 48 hours, respectively, in comparison with diosgenin alone (Table 2). DNA fragmentation was also studied using the same conditions, and we found that pretreatment with celecoxib before diosgenin treatment reduced the production of mononucleosomes and oligonucleosomes by 47% and 46% at 24 and 48 hours, respectively; P < 0.05) in comparison with diosgenin alone (Fig. 7a). In contrast, exogenous PGE2 did not have the same effect as endogenous PGE2: we showed that the addition of 10 μM exogenous PGE2 alone or in the presence of celecoxib before diosgenin treatment reduced DNA fragmentation in comparison with diosgenin alone (Fig. 7b). Human rheumatoid arthritis (RA) fibroblast-like synoviocytes (FLS) were preincubated with or without celecoxib (1 μM) or IL-1β (1 ng/ml) for 4 hours, and then 40 μM diosgenin was added for 24 or 48 hours. The concentration of prostaglandin E2 (PGE2) was measured by enzyme immunoassay and is expressed asng/ml for 105 cells. Data are PGE2 concentrations expressed as mean ± SD of three experiments from three different patients. The PGE2 concentrations under the other conditions at 24 or 48 hours, respectively, were 1.39 ± 0.41 and 1.21 ± 0.26 for culture with medium alone, 0.73 ± 0.19 and 0.66 ± 0.12 for celecoxib alone, and 20.26 ± 3.19 and 17.42 ± 3.03 for IL-1β alone. * ,#A P value of less than 0.05 (Fisher's protected-least-significant-difference test) was considered to indicate significance in comparison with diosgenin alone. 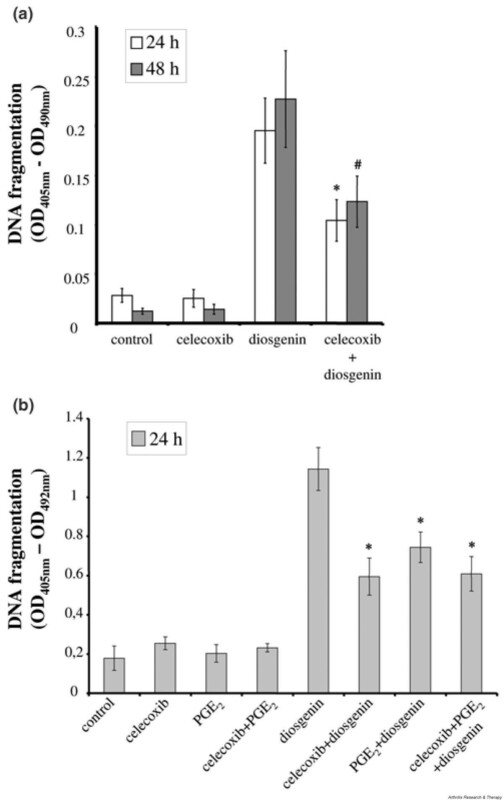 Effect of diosgenin on DNA fragmentation after incubation with celecoxib (an inhibitor of cyclooxygenase-2 [COX-2]) (a) or exogenous prostaglandin E2 (PGE2) (b). (a) Human rheumatoid arthritis fibroblast-like synoviocytes (FLS) were preincubated with or without celecoxib (1 μM) for 4 hours and then 40 μM diosgenin was added for 24 or 48 hours. Measurements were made on FLS from four different patients. Data are expressed as mean ± SD of four experiments. *,#A P value of less than 0.05 (Fisher's protected-least-significant-difference test [PLSD]) was considered to indicate significance in comparison with diosgenin alone. (b) Cells were preincubated with or without celecoxib (1 μM) in the absence or presence of PGE2 (10 nM) for 4 hours, followed by incubation with 40 μM diosgenin for an additional 24 hours. Measurements were made on FLS from four different patients. Data are expressed as mean ± SD of four experiments. *A P-value of less than 0.05 (Fisher's PLSD test) was considered to indicate significance in comparison with diosgenin alone. OD, optical density. Stimulation of RA FLS with IL-1β before diosgenin treatment dramatically enhanced COX-2 activity over time: we showed that PGE2 synthesis increased 38- and 139-fold (P < 0.05) over 24 and 48 hours, respectively, in comparison with diosgenin alone (Table 2). The addition of IL-1β alone had no effect on human RA FLS apoptosis (Fig. 8). On the contrary, DNA fragmentation increased significantly after stimulation of the cells with IL-1β before diosgenin treatment (2.7- and 3.6-fold at 24 or 48 hours respectively; P < 0.05) in comparison with diosgenin alone (Fig. 8). Effect of diosgenin on DNA fragmentation after stimulation with IL-1β (an inducer of cyclooxygenase-2 [COX-2]). Human rheumatoid arthritis fibroblast-like synoviocytes (FLS) were preincubated with or without IL-1β (1 ng/ml) for 4 hours and then 40 μM diosgenin was added for 24 or 48 hours. Measurements were made on FLS from four different patients. Data are expressed as mean ± SD of four experiments. *,# A P value of less than 0.05 (Fisher's protected-least-significant-difference test) was considered to indicate significance in comparison with diosgenin alone. OD, optical density. Human RA FLS are major producers of IL-6 and IL-8 in synovium and these proinflammatory cytokines participate in the pathogenesis of RA. Moreover, it is known that proinflammatory cytokine production can be activated during apoptosis of other cell types. Our results showed that only IL-8 production (Fig. 9b) was significantly increased after 48 hours of diosgenin treatment (3.3-fold; P < 0.05) in comparison with control. 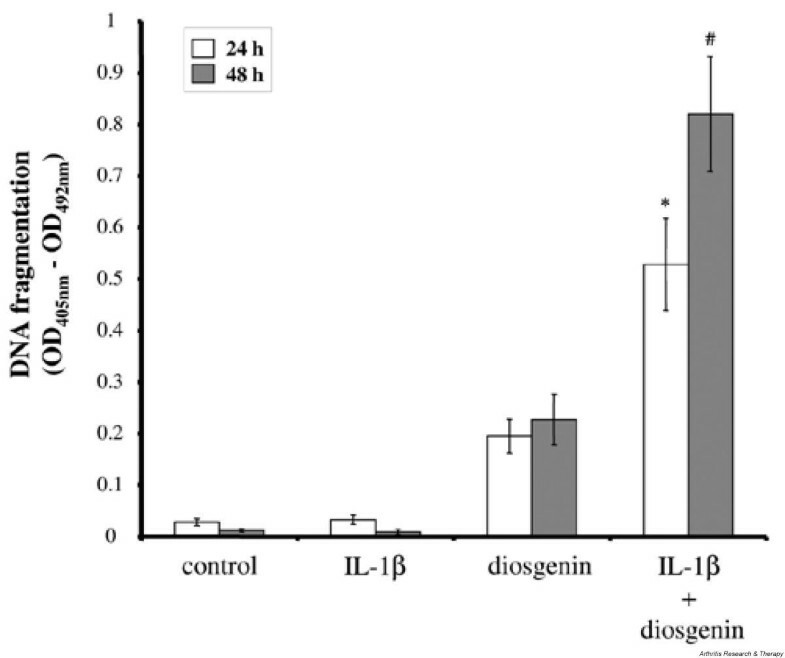 IL-6 secretion was not modified over time with 40 μM diosgenin in comparison with controls (Fig. 9a). Moreover, we showed that diosgenin had a synergistic effect with IL-1β stimulation on the production of IL-8 by human RA FLS (Fig. 9b) but not of IL-6 (Fig. 9a). IL-1β-stimulated IL-8 production was increased 1.5- and 2.2-fold (P < 0.05) after diosgenin treatment for 24 and 48 hours, respectively, in comparison with IL-1β alone (Fig. 9b). Effect of diosgenin on the production of IL-6 (a) and IL-8 (b) by human rheumatoid arthritis (RA) fibroblast-like synoviocytes (FLS). Cells were stimulated or not with IL-1β (1 ng/ml) for 4 hours and then 40 μM diosgenin was added for 24 or 48 hours. The control bars represent unstimulated cells. The concentrations of IL-6 and IL-8 were determined in culture supernatants by ELISA. Measurements were made on FLS from three different patients. Data are expressed as mean ± SD of three experiments. # A P-value of less than 0.05 (Fisher's protected-least-significant-difference [PLSD] test) was considered to indicate significance in comparison with controls, and **, ##P value of less than 0.05 (Fisher's PLSD test) was considered to indicate significance in comparison with IL-1β alone. Diosgenin is a steroidal saponin, which is extracted from the root of wild yam (Dioscorea villosa). It has been reported to have various effects, such as a hypocholesterolemic action in the rat , or an antioxidant activity in HIV patients with dementia . This steroid was used for our work because we recently showed that it alters cell cycle distribution and induces apoptosis in the human osteosarcoma 1547 cell line, with up-regulation of COX-2 activity [35, 36]. It has been previously suggested that both COX-1 and COX-2 are expressed by human RA FLS and that the expression of COX-2 messenger RNA and protein is enhanced by proinflammatory cytokines such as IL-1β and tumor necrosis factor α . Our report is the first work on the induction of apoptosis in human RA FLS by diosgenin. Diosgenin caused a dramatic increase in COX-2 expression over time, correlated with a strong production of PGE2. These results suggest that the induction of apoptosis by diosgenin was associated with an up-regulation of COX-2. This study also showed that human RA FLS treated with diosgenin became rounder, shrank, and became separated from adjacent cells. Apoptosis is a highly orchestrated and controlled form of cell death, distinct from the pathologic process of necrosis that occurs as a result of cellular damage. Apoptosis involves specific initiating stimuli and intracellular signals and requires expression of a well-defined set of genes that accomplish the cellular program. In general, apoptosis involves sequential activation of a proteolytic cascade of enzymes called caspases . Caspase-3 activation is considered a convenient marker of apoptosis and is regarded as the point of no return in the proapoptotic signalling cascade . In our study, RA FLS death was clearly related to the activation of the caspase cascade, as diosgenin increased the caspase-3 activity over time. This finding provides other important information, particularly about the relevance of the mitochondrial pathway  in this phenomenon. Indeed, diosgenin induced also a loss of Δψm, suggesting the important role of mitochondria in diosgenin-mediated apoptosis of human RA FLS. Recently, Itoh and co-workers  showed a crucial involvement of mitochondria in Fas-mediated apoptosis of RA synovial fibroblasts associated with the activation of caspase-3. RA FLS death induced by diosgenin was quantified by the determination of cytoplasmic histone-associated DNA fragments. The apoptotic ratio, determined by ELISA, significantly increased over time for cells treated with diosgenin. Curiously, we showed that the level of apoptosis in RA FLS treated with diosgenin seemed to be associated with up-regulation of COX-2 (Fig. 10), in contrast with most data from other cell types such as cancer cells, in which COX-2 expression has been shown to prevent apoptosis. Indeed, overexpression of COX-2 in several pathological conditions, such as colon carcinoma, has pointed to a causative role of COX-2 in tumor initiation and/or promotion [20, 23]. 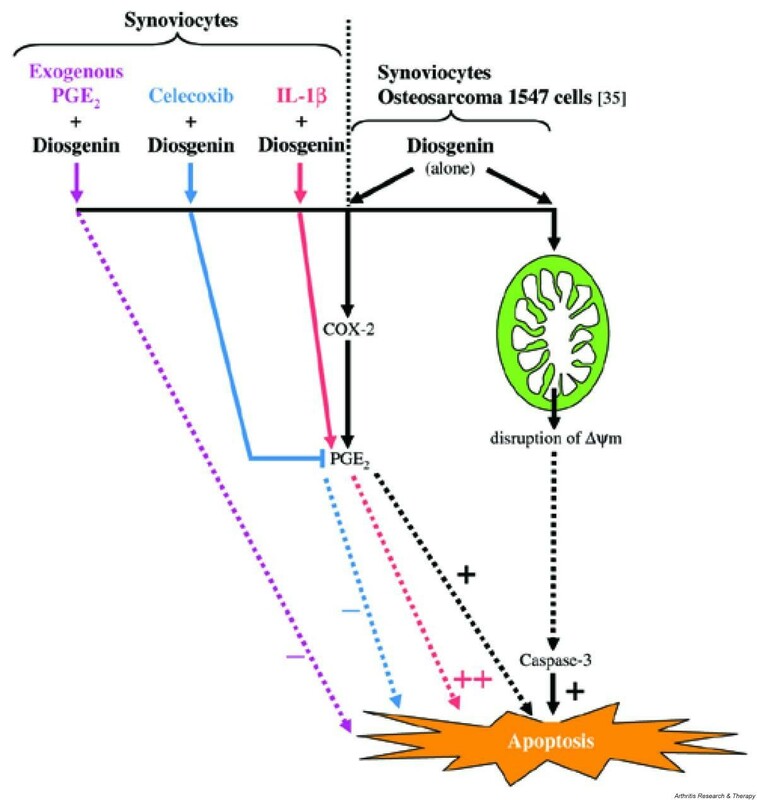 On the other hand, increased PGE2 has been shown to be related to the induction of apoptosis in chondrocytes in the growth plate , and more recently Pelletier and co-workers  found that the in situ increase in chondrocyte death/apoptosis in experimental osteoarthritis was mainly caspase dependent and was influenced by up-regulation of the level of COX-2. Concerning the studies on synoviocytes, it was shown that nitric oxide induced synoviocyte death through COX-2 expression and PGE2 synthesis, with a significant change in Δψm associated with the activation of caspase-3 . These results concerning the effects of nitric oxide are in harmony with our study on the effects of diosgenin on RA FLS. Recently, we reported that diosgenin-induced apoptosis in human 1547 osteosarcoma cells was associated with an increase of PGE2 production . All these works show that the effects of COX-2 and related PGE2 in the regulation of apoptosis reflect differences in cellular responses. For this reason, our study was focused on COX-2, to find out whether its up-regulation was a cause or a consequence of diosgenin-induced apoptosis in human RA FLS. Diagram summarizing major events in diosgenin-induced apoptosis in human rheumatoid arthritis (RA) fibroblast-like synoviocytes (FLS). The effect of diosgenin is associated with a loss of mitochondrial membrane potential (Δψm), caspase-3 activation, and DNA fragmentation. Furthermore, diosgenin causes an inhibition of human RA FLS cell growth with apoptosis induction associated with up-regulation of cyclooxygenase-2 (COX-2). Celecoxib, a selective COX-2 inhibitor, provokes a large decrease in diosgenin-induced apoptosis whereas IL-1β, a COX-2 inducer, strongly increases diosgenin-induced apoptosis of human RA FLS. These new studies provide strong evidence that modulation of COX-2 is associated with diosgenin-induced human RA FLS death. As exogenous prostaglandin E2 (PGE2) alone did not induce synoviocyte apoptosis, the exact mechanism by which endogenous PGE2 sensitizes human RA FLS to cell death is still not clear. The recently developed selective COX-2 inhibitors (coxibs) are now being used as anti-inflammatory agents to treat patients with RA. A large-scale clinical trial of celecoxib has provided evidence that this coxib can reduce the incidence of severe upper gastrointestinal toxicity in patients with RA [44, 45]. However, at high concentrations (>10 μM), celecoxib caused apoptosis of RA FLS  and also of cancer cells . By using a selective inhibitory concentration (1 μM) , our study demonstrated that COX-2 inhibition by celecoxib provoked a large decrease in diosgenin-induced apoptosis of human RA FLS even in the presence of exogenous PGE2. These results are in agreement with the study of Jovanovic and co-workers , in which the authors reported that, in human osteoarthritic synoviocytes, selective inhibition of COX-2 by NS-398 significantly inhibited sodium nitroprusside-induced apoptosis, even in the presence of exogenously added PGE2. On the other hand, after stimulation of cells by IL-1β, which dramatically enhanced COX-2 expression and activity, our work showed that consecutive diosgenin treatment induced a large increase in apoptosis of RA FLS over time, with an increase in COX-2 activity in comparison with diosgenin alone (Fig. 10). These new investigations provide strong evidence that modulation of COX-2 is associated with diosgenin-induced human RA FLS death but, as exogenous PGE2 alone did not induce synoviocyte apoptosis, the exact mechanism by which endogenous PGE2 sensitizes human RA FLS to cell death is still not clear. One hypothesis could be that, because endogenous PGE2 is synthetized by endogenous arachidonic acid, this fatty acid may participate in the effect of diosgenin. This could explain the different effects observed between endogenous and exogenous PGE2. Our study shows for the first time that diosgenin, a plant steroid, induces an inhibition of human RA FLS cell growth with apoptosis induction. We show that diosgenin-induced apoptosis is associated with an increase of endogenous COX-2 activity: celecoxib, a selective COX-2 inhibitor, provoked a large decrease of apoptosis whereas IL-1β, a COX-2 inducer, significantly increased diosgenin-induced apoptosis of human RA FLS. Moreover, the effect of diosgenin is associated with the disruption of Δψm, caspase-3 activation, and DNA fragmentation (Fig. 10). Although the excess endogenous production of PGE2 appears to be associated with the induction of RA FLS death, the exact mechanism by which this compound brings about this phenomenon remains to be elucidated. This study was supported by grants from Pharmacia Laboratory and Ministère de l'Education nationale, de la Recherche et de la Technologie. The authors acknowledge Dr Raphaël Duval for his excellent technical assistance.